It’s been a while! I hope you and everyone around you are doing well! I’ve been working my tail off at work with all 720 0r 730 students…I’m still trying to comprehend the numbers and the students are still coming and going! I have also started my fall Food for Life Cooking classes for Cancer Prevention and Survival. Today, I was supposed to go on a walk for Farm animals in Seattle with my vegan friends, but I’ve caught “a bug” at the school where I teach and felt it best if I stayed home. I’d be lying if I told you I never caught a cold on a whole foods plant-based vegan diet. After all, I am human and happen to work in a “petri dish of germs” – with younger students ranging from five years old to 11. However, my immune system is functioning way better and I’m able to fight off these minor colds in a shorter period of time than in the past, when I wasn’t on this diet! So instead, I stayed home and made this soup that is not only very simple and easy to make, but delicious! Wash potatoes and leeks. 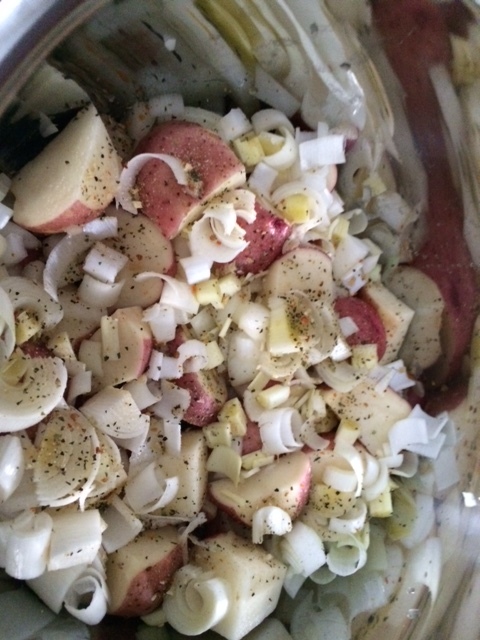 Cut the potatoes into chunks and add to Instant Pot (if you have one or else use a medium pot to boil them in). If you do own an Instant pot, then chop up the garlic and onion and add as well. 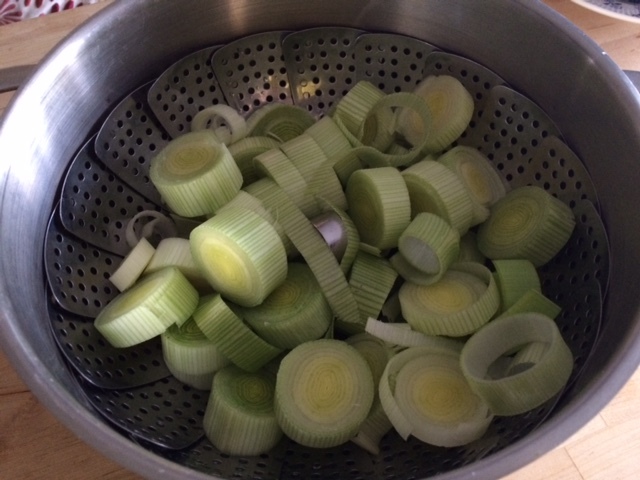 Add some of the washed leeks as well, chop into smaller pieces, and then finally add the 21 Seasoning Salute. Add half a cup of the Vegetable broth. 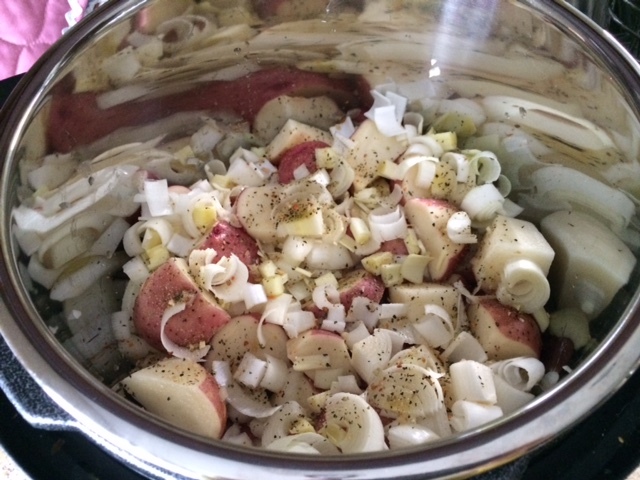 Cook on Manual for four minutes in Instant Pot or else cook the potatoes first, then mash in after cooking in a regular pot, adding the garlic, onion and spices. Steam the leaks. Do not overcook these! Heat up the rest of the broth and add about half of the water that you used to steam the leaks with. Add leaks, mashed potatoes, onion and garlic. Bring to a boil and you are done. 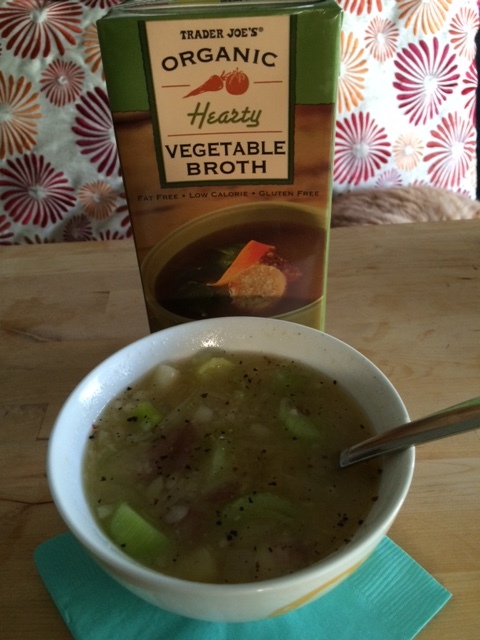 This simple, yet delicious “cold buster soup” is ready! Salt and Pepper to taste. This whole meal took about 20 minutes at the most to make. It’s very easy, especially if you’re feeling “off”. I have already had two servings of it, but there is plenty more. This would also be a nice soup to have before any other meal and it serves at least four people! If you make it, please let me know what you think of it!